Cloth diapering Eww! Or Oooh! ? Do you think cloth diapering is gross? Or impractical? Or what about outdated? Many crunchy mamas have cloth diapered for years and now we are starting to see the “modern” woman take notice. Cloth diapering is neither gross, impractical or outdated. There are many options for any family structure and budget. Cloth diapering saves a family approximately $1500 over 2 years versus buying disposables. This is of course an estimate, some families will spend more than $2000 on disposables and some will spend less. Needless to say Jacks crunchy mama cloth diapers. We have quite an array of fabrics, styles and accessories in his CD (cloth diaper not compact disc) wardrobe. Saves me a ton of $$$! Wait did I say cute, Cute, CUTE! ?! Go to a local CDing store and get your hands on them! Play and see which would work best for your family. The modern CD goes onto the baby like a disposable and comes off the same way! It’s not complicated or tricky for the most part. Not all CD’s are created equally- in this case you usually get what you pay for… For my local Baton Rouge followers Angel Britches is the best local option for you. Ok so there is another side to this whole cloth diaper thing! You do have to wash poop out of them. Here’s the skinny on washing CD’s. 1. Only use a CD approved detergent and then use it on all laundry to avoid mixing. 2. Get a diaper sprayer!!! Makes life so much easier to get the poop out of diapers and inserts. But watch the water pressure and make sure to get down low to the toilet to avoid a poo-shower of sorts. 3. Wash according to manufacturers directions! It’s best to hang dry but I use the dryer for everything in this house. 4. Remember it’s not a big deal if you touch a little pee or poop- this child used to do all those things inside you before birth. 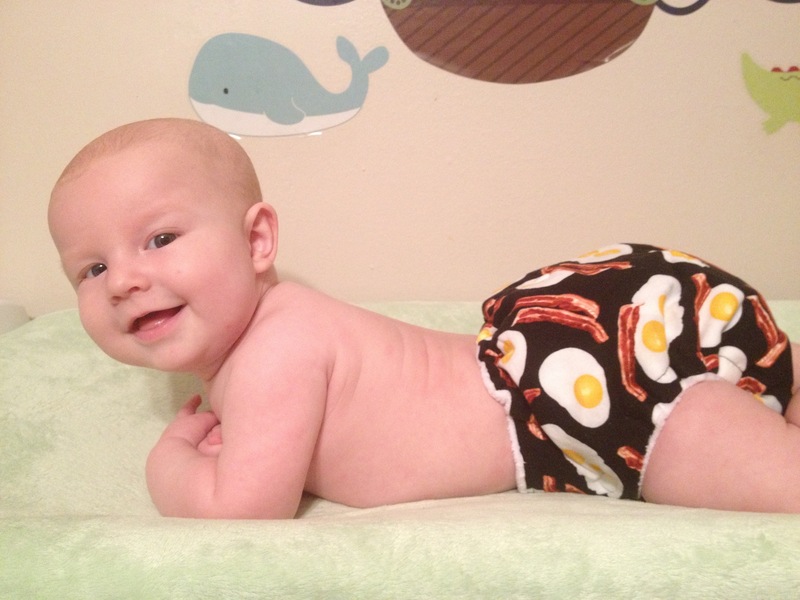 I will be doing a review soon for Snuggly Baby boutique diapers and also BottomBumpers. Be on the look out for those! 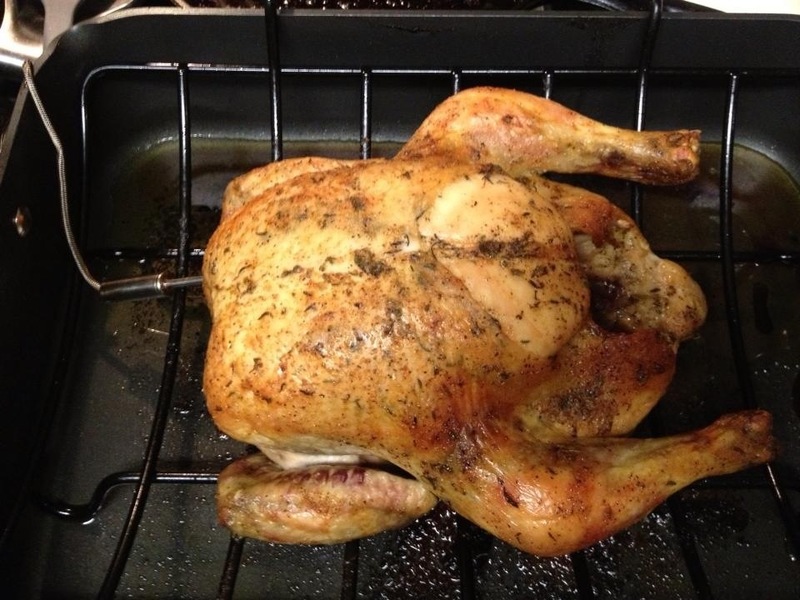 Roasting a whole chicken is often a feared task because often the chicken turns out a less than appetizing pale yellowish color and dry as an old dogs bone. In reality a whole roasted chicken is actually one of the easiest and most satisfying meals you can make. It is one of my favorites for sure. Try to buy local, fresh and organic whenever possible. My secret weapon is a digital prob thermometer. This can be purchased at any cooking store, online or most grocers. I personally own this model from sur la table click here & a deep roasting pan with elevated rack. If you do not have a rack simply elevate the chicken with large carrots and celery bunches. Air needs to be able to circulate around the chicken totally. 1. Make sure chicken is totally defrosted and wiped dry. 2. Place chicken onto rack or vegetables in roasting pan, tucking the wings under the back. 3. Insert probe from thermometer into the thickest part of breast making sure not to hit a bone or enter the empty cavity ( this is important in order to have an accurate temperature reading). 4. Zest one lemon into a med size bowl. And add the juice from said lemon after zesting. 5. Add all remaining ingredients excluding the other lemon and bay leaves. Mix well. At this point you should have a bowl of delicious fragrant garlic lemon and thyme butter. It’s hard but try not to eat it! 6. Using your finger or back of a table spoon gently separate the delicate chicken skin from the meat working from breast to tail. And then from tail to breast being especially careful with the leg skin. If you tear it, slow down and keep working. This takes some practice so relax. 7. Push the butter mixture under the skin of the chicken until it is evenly distributed throughout leaving enough for the top of the skin as well. Rubbing the skin prior to adding butter on top will help move it into hard to reach areas such as the leg. 8. Rub the remaining butter mixture all over outside of the chicken. 9. Cut remaining lemon in half. Place one half inside the chicken cavity followed by the 2 bay leaves and then the other half of lemon. Place chicken into 500 degree oven for about 20mins until skin is brown. This time may vary from oven to oven. Your chicken may need to be turned around also if your oven does not heat evenly. Try to watch through the glass instead of opening the oven as frequent opening will result in a longer cook time. When skin is mostly brown on top reduce oven heat to 350 degrees and continue cooking without opening oven until your thermometer reads 160 or 165 whichever you desire. Remove chicken and let rest for approx 20-30mins without cutting or removing probe. Removing the probe or cutting without allowing a resting time will allow the juices to escape and dry out your bird! Enjoy! And save that chicken carcass in the freezer for later! Coming soon- making your own chicken broth from left over bones. Eating healthy is too expensive! Fact or Fiction? I cannot tell you how many people tell me in conversation “it’s just too expensive to eat healthy”. While there are a lot of things by comparison that are more expensive to buy organic or natural over conventional- many things are less expensive. 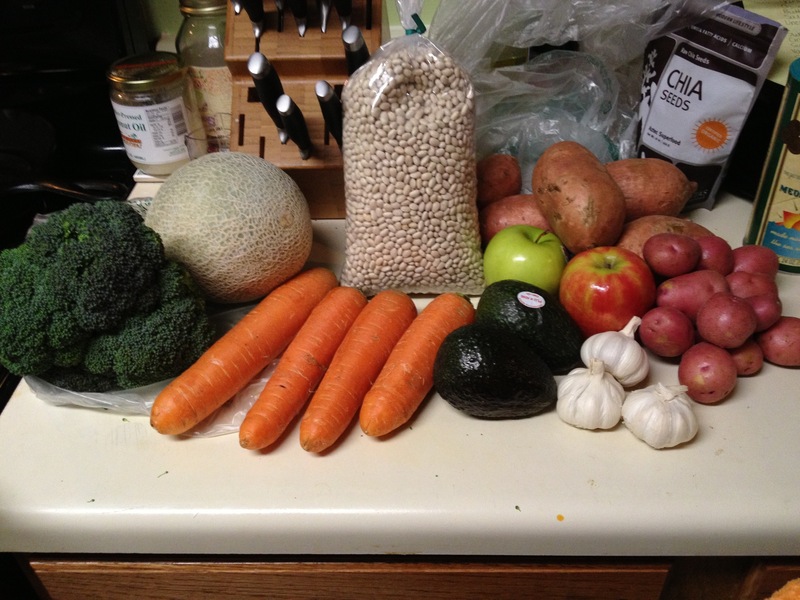 How much would you guess this would cost in a traditional grocery store? Or even Whole Foods? $25, $35, $45? I can tell you that avocados are usually $1-1.50 ea, and that broccoli would’ve been $4, Navy beans $6-7 so that about $11-12 right for just the 3 items. I paid $15 for all of that food. In this case buying healthy local and fresh was a lot less expensive. I encourage you to seek out a farmers market or local produce stand and see the difference for yourself! The Undercover Mama nursing tank. A strapless tank top with attachments to convert any shirt into a modest nursing top. One would simply attach the undercover mama tank to a clip down nursing bra and then layer any other shirt on top. Then when the baby is hungry and needs to nurse, simply lift the top layer, and unclip the bra. Babe is nursing with ease and mother’s back, sides and most of her chest is still covered. Because it is affordable, just about any mama on any budget can own one or more of these tanks. I personally own 2… so far (i plan to order more very soon). The wide variety of colors make them easy to match with an over shirt from your existing wardrobe. There is also a lace trim option for dressy occasions. The sizing runs from XS-XXL means it will fit most who are interested in this product. Undercover mama recommends a size smaller than normally worn to achieve a snug fit. Plus after you are done nursing, you can still use it with regular bras due to the double attachment feature. I find this product to be comfortable, practical and affordable. It is all that it claims to be. I give it a 5/5 rating.